When you move into the Harborside Village Apartments, you won’t need to change much to make it feel like home. Our luxury apartments already come equipped with all the amenities you could ask for, but we understand that personalizing your space is important to you. Because we know you want a little bit of unique flair, here are some tips from Harborside Village on adding your personal design stamp to your new apartment! 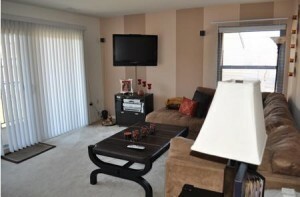 Painting a new apartment can be a hassle, and it is not something that most renters are able to do. Plus, imagine if you selected a color that you quickly grew tired of and you were stuck with it! If you want to incorporate color into your apartment, select painted wood furniture, or paint it yourself if you’re feeling crafty. A cool turquoise bookshelf or a lavender end table could bring just the right amount of color into your life without being overwhelming. If your apartment has carpeting or another kind of flooring that you like, but do want to update a little, use fun area rugs to spruce up a space and keep the color and design schemes of your individual rooms cohesive. Make sure to use rugs with a thinner pile on carpeting, and to secure rugs on hardwood or tile floors with rubber mats so that they don’t slide around! Want to hang pictures without leaving nail holes and hammer marks in your luxury apartment walls? There are increasingly more and more no-nail solutions to hanging frames, including decorative textured tape and poster putty. With temporary fixtures like these, you can choose to rearrange your photos and artwork as often as you want! One of the best ways to change up your apartment is the simplest makeover trick in the book: fresh flowers! Fill vases with beautiful bouquets that will both change the look of your space and fill your home with their lovely scent. At this time of year, look for blossoms that fair well in the summer time, and switch your flowers out every other week or so to keep things fresh! This entry was posted on Monday, July 14th, 2014	at 6:16 pm	. Both comments and pings are currently closed.